Looking for a light salad to whet your appetite or are you looking for a flavoursome salad which will help in your weight loss quest? 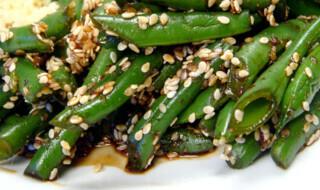 Then this French bean sesame sauté is a must-make recipe. Rich in fibre thanks to the French beans and calcium, contributed by the smattering of sesame seeds, this salad is guaranteed to fill your stomach up if consumed heartily. Happy chomping! Add French beans and cook for 2 minutes. Drain and immediately transfer to a bowl of cold water and stop cooking. Drain again. Heat oil in a pan and add in French beans and fry for 2-3 minutes continuously. Add sesame seeds while sautéing beans. Add garlic, salt and pepper to the beans.